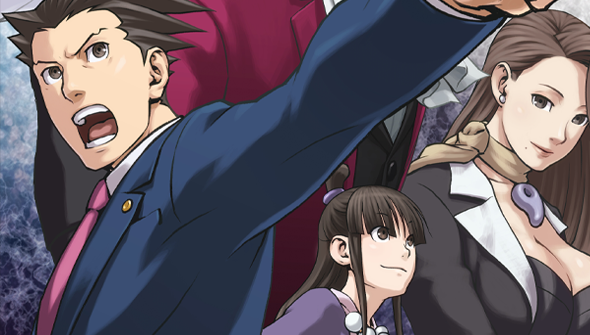 Capcom's Ace Attorney series of video games see players step into the shoes of expert defence attorney Phoenix Wright. The games revolve around a series of court cases, where Wright must use his sharp skills to defend his clients and uncover the real culprits. First published in 2001 on the Game Boy Advance, the series has been highly successful and lead to a number of spin-offs featuring other characters and even a live-action movie from highly prolific 13 Assassins director Takashi Miike. At this year's Tokyo Game Show, Capcom have been showing off the latest version of the game Ace Attorney 6 for the Nintendo 3DS. However, they also used the occasion to announce another exciting bit of news for fans- that Ace Attorney is getting an anime TV series that will air in Japan April 2016. The series has always largely been based on interactive anime-style sequences, to the degree that it feels like an anime already. The most surprising thing then, is that it's taken so long for this to happen. It's got a cast of popular characters and a ready and willing fanbase. It also has a concept that will be a natural fit for television. At the same time, it should be pretty unusual- after all, how many animated court-room dramas can you think of? Exactly. As long as it translates the game's visuals accurately, and keep the iconic imagery, then we certainly have no OBJECTION to this news. No more details have been announced at this time.